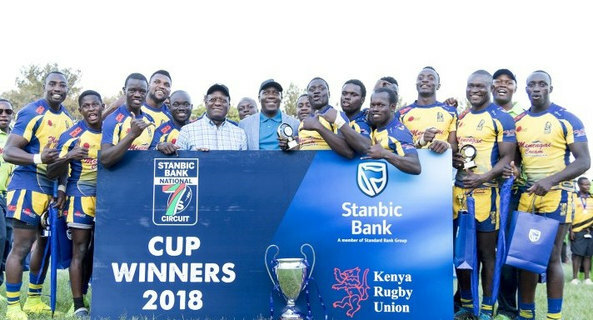 Homeboyz RFC celebrated winning the National Sevens Circuit in emphatic fashion by winning the season-ending Chjristie Sevens title 24-19 courtesy of a Leonard Mugaisi stoppage time sudden death try. Homeboyz were already crowned champions even before the final having progressed to the Main Cup semis while their closest challengers Mwamba RFC never made it past the last eight losing to South Africa’s Blue Bulls and Tuks. Heading into the final, Paul Murunbga’s men were in it for the pride and they sure did give a good account, coming from behind. Mugaisi was sin binned early, Quins going ahead moments later through Cyprian Kuto, the ensuing conversion from Aaron Ofoyrwoth taking the score to 7-0. Alex Olaba would set up former Homeboyz man Kuto for his brace, Ofoyrwoth converting for a 14-0 lead. But a hard fighting Homeboyz reduced the deficit just before half time, Jeff Oluoch racing clear, fending off Kuto in the process as he touched down for the deejays with Johnstone Olindi converting to bring the score to 14-7. Homeboyz drew first blood in the second half, Oluoch going over, Olindi converting to level up matters, 14-14 and a cup final to play for. Ofoyrwoth would score on a counter attack to give Quins the lead, the tension felt across the stadium with the scores 19-14 to the hosts. Homeboyz went chasing the game, putting Quins on the ropes. Quins were reduced to six men when Okia was sent to the bin, Olindi with the equalizer for the newly crowned circuit champs, a very tense 19-19 score at full time. Mugaisi would win it in sudden death for Homeboyz, successfully gathering his kick to touch down and bring matters to a close.